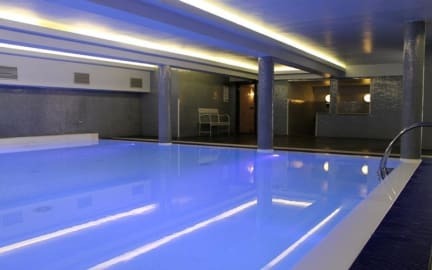 We like that PLUS Florence offers so many onsite facilities to guests, including a swimming pool, restaurant and a bar that guests have praised for being 'lively and colourful'. This hostel is located in the northern part of central Florence, near Santa Maria Novella train station and a short walk from the rest of the city. Hostelworld travellers have frequently said they appreciate the 'incredibly helpful and friendly' staff. Our brand-new outdoor pool is now open! PLUS Florence is a unique luxury hostel located right in the city centre and within walking distance to all the top sights, only a ten-minute walk from the main train station. We set the bar for budget accommodation not only in Florence but in Europe as a whole. Youll easily notice the difference when looking at just some of the amazing facilities we offer: a swimming pool, onsite caf, bar and restaurant, PLUS Tours travel desk, panoramic terrace bar, spacious dorms, a flat-screen TV in every room, PLUS girls-only rooms, Wi-Fi, DJs and more and that's just the beginning! Jump online and stay in touch with your loved ones as we have Wi-Fi throughout the hostel as well as our own internet caf. Our mixed/shared dorms are light and open-spaced rooms that sleep four, five, six, seven or eight people. All beds come with a private reading lamp, crisp white bed linen, cosy fleece blankets and pillows. Each bed has its own storage locker that can be locked. The rooms also have an ensuite WC and shower. Our PLUS Girls Only rooms have been designed with women in mind; all rooms are ensuite, bright, airy and stylishly decorated and sleep four, five, six, seven or eight ladies. For those little extra home comforts you get larger bathrooms, a vanity table with mirror, big fluffy towels for use during your stay, hair-dryers, and complimentary welcome cosmetic pack. PLUS Florence has just turned 4! So to celebrate we are giving away a free night to anyone who wants to celebrate their birthday with us. It's very simple all you need to do is make a booking for a minimum of two nights and as long as your birthday falls on one of those days we wont charge you for that night! The offer is not valid with any other promotion or offer. Upon arrival, booking reference must be presented with a valid form of photo I.D. Any deposit made will go towards the other night(s) booked and the free night is equal to or lesser value of what youve booked; not valid for double or twin rooms (so, dorm rooms only). And that's it. We told you it was simple. Our all-you-can-eat breakfast buffet is available for just 6. It includes both full English and continental options. If you do find that the private rooms are unavailable, we have another great site in Florence - PLUS Camping Michelangelo - that will almost definitely have something available. Check it out here on Hostelworld. Experience the PLUS difference at these other great locations in Europe: PLUS Prague, PLUS Camping Roma and PLUS Camping Jolly in Venice and the brand spanking new PLUS Berlin. We loooooved Plus. We stayed for four nights and were sad to leave. Florence is beautiful but hot and dirty, so having a cold shower in a room that felt like a luxurious hotel suite was fan tas tic. Beds were good and we got clean towels every two days. We booked a six bed female, but got a four bed female. Best place we stayed in during our interrail trip by far. I really liked this hostel! It has a lot of facilities available for their guests and are very helpful and friendly. I recommend this place! Great hostel. The only downside, however, is that it doesn't feel as a hostel in anyway. And the staff does treat you like you are in a hotel which I do not like. But that's it, it is a awesome hostel for sure! Nice hostel! With many facilities! The Hostel is huge, but clean, with great showers, a sauna and an amazing pool! Wel heel groot voor een hostel. Hele groepen bussen kwamen er. Miste beetje het huiskamer gevoel. I was lucky I had the best roommates ever, because otherwise I don't think I would have met other travelers that easy as a solotraveler. Not really social common areas other than the bar at night. The 6 beddorm was perfect, 2/4 seperated by a wall and bathroom en suite. The 10 min walk to the centre was perfect! Breakfast is way to expensive for me (€7), I'd recommend to go to the marcado central! Food for every time of the day there. Try the strawberry gelato! Toen ik er was waren er veel jongeren tussen de 18-20, die nog tot laat erg luidruchtig waren met rennen over de gangen etc. Vond het jammer dat er voor de prijs die je betaald er geen ontbijt was. Je betaald nog 7 EUR voor het self service ontbijt. The hostel has a great location. It is a short walk from the trainstation and very close to the city center. The swimmingpool is very nice but the water ice cold! I enjoyed my stay here. I think the best aspects to our hostel are the extra facilities, such as the outdoor swimming pool in the summer, an indoor pool in the winter, a sauna in winter, and great bar and restaurant. How many backpackers can say they stayed in a hostel with a sauna and a pool? The hostel is ideally located, with The Academia only a short walk away. The Duomo is also really close to us. No visit to Florence is complete without visiting the Uffizi Gallery - remember to book early to avoid the queues. We also have theme nights such as toga parties in our Opera bar and restaurant. Don't miss out on our cheap drinks during happy hours! We have a mix of ages staying in the hostel, with most travellers in the 18 - 40 age range. I personally find that it is very easy for travellers to meet others and congregate in our hostel. Finally, we have some specific rooms for people with disabilities as well as elevators and ramps that are always available if needed.